You may have surely heard about this word C language. I know many have wondered about what is it, specially non engineer students. In this article, you will have a brief knowledge about this thing. Let us start studying this basic programming language. 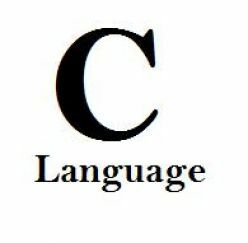 As the name suggest “C language”, it is a language. We all know what a language is. Language is a medium through which we interact with other people. Similarly, C language is a language that is used to interact with the computer or computing machine. The C programming language is a standardized programming language developed in the early 1970s by Ken Thompson and Dennis Ritchie for use on the UNIX operating system. It is one of the most widely used general purpose programming languages. C is prized for its efficiency, and is the most popular programming language for writing system software, though it is also used for writing applications. But still there is one twist in using C language. As C is a medium level language (some refers it as a high level language). But computer understands machine language i.e digital or binary values 0 and 1. To make compatibility with computer, this language uses a compiler or simply a translator which create the object code that is understandable by the computer. BCPL — a user friendly OS providing powerful development tools developed from BCPL. Assembler tedious long and error prone. A new language “B” a second attempt. c. 1970. By 1973 UNIX OS almost totally written in “C”. C is an excellent language which encapsulates a lot of characteristics. But we will study some of its main characteristics in brief. C Programming provides various low level features that are generally provided by the Lower level languages. C is closely related to Lower level Language such as “Assembly Language“ which use mnemonic codes. This is the one of the most preferable feature of the C language. As discussed earlier C language uses compilers which brings its portability. The portability means it is possible for C programs to run it on different PCs or systems. C provides a wide range of Data Types and functions. Various useful Control & Loop Control Statements can be implemented. Contains rich set of operators. C allows the user to add functions to the library. It is more efficient language and simpler to use. It is an ideal language for beginners. Ability to extend the existing software by adding new features is called as extendability. ‘C’ language has right number of reverse words which allows the programmers to have complete control on the language. ‘C’ is also called as programmer’s language since it allows programmers to induce creativeness into the programmers.